ESPN is starting up a 3D channel with the WC being one of their first big broadcasts. I saw that in the papers last night. 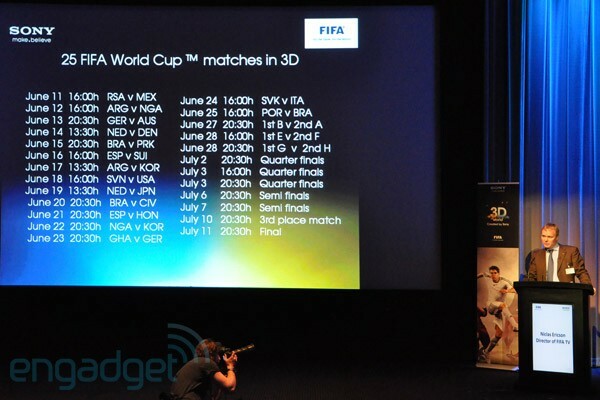 Sony and FIFA have just released a list of World Cup 2010 games that'll be broadcast in 3D, with ESPN taking care of the US audience, Sogecable for Spain, and more partners to come (including eight matches for selected 3D cinemas around the world). Out of all ten stadiums, only five of these -- Soccer City and Ellis Park in Johannesburg, Durban, Cape Town and Port Elizabeth -- are chosen for the 3D broadcast, which sadly leaves out Rustenberg and its England-USA match that most of us here anticipate. Each venue will have seven 3D-camera positions with three above the pitch and four on pitch level, and don't forget the two "3D Outside Broadcast" trucks that'll be busy shuffling between stadiums to process the footage for us all. If you end up totally loving the 3D experience, a Blu-ray 3D compilation disc will be available within 2010. This souvenir should go nicely with the updated PS3 by then -- we were told by Sony that its console's expecting its 3D upgrade around the same time as the launch of its 3D TVs, which just so happens to be around E3 as well. Boy, June sure going to be a fun one this year. Following the initial joint announcement to make the world's first FIFA World Cup™ available in 3D, FIFA and Sony Corporation today unveiled insights into what the football fans around the globe can expect from this innovative undertaking to add a third dimension to the football viewing experience. Coinciding with the rapidly growing consumer interest in 3D fuelled by the release of blockbuster movie titles in 3D and impending launch of 3D TV sets for the home, the first ever FIFA World Cup™ in 3D will further capture the excitement for millions of football fans around the globe. With a total of seven pairs of Sony's professional HDC cameras on rigs at every match (model: HDC-1500), the action on the pitch will be captured in a stunning 3D quality enabled through its proprietary multi-image processor (model: MPE-200) and 3D Outside Broadcast truck. Sony's cutting-edge processor, the only one in the market to date, makes an end-to-end workflow possible in the production process and automatically adjusts the depth-of-field to ensure an unprecedented and optimal 3D viewing experience around the world. Starting from the FIFA Confederations Cup last year in South Africa, Sony has been working on enhancing the 3D capturing of fast-moving football action and has since conducted a number of 3D filming trials in Europe. "The 3D feed from these 25 matches will be made available for broadcast on 3D channels, which can be enjoyed by consumers on their 3D-compatible TV sets in the comfort of their home, almost as if they were in the football stadium themselves," said Niclas Ericson, Director of FIFA TV. "Whilst discussions with major broadcasters are ongoing, I am very pleased to announce the first confirmed partners for the 3D live broadcast, who are ESPN in the US and Sogecable in Spain. We expect further announcements to be made shortly," he added. In line with FIFA's and Sony's endeavour to make this new exciting 3D viewing experience available to as many football fans as possible, a dedicated global 3D public viewing project will debut at this year's FIFA World Cup. 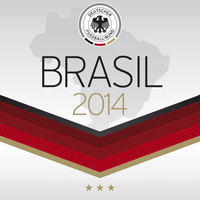 Eight matches will be fed live to digital cinemas and selected venues in 3D HD quality around the globe. To this end, FIFA has appointed Swiss-based Aruna Media AG to manage the exclusive 3D cinema and entertainment venue rights for live games in 3D. Aruna plans to broadcast live 3D coverage of matches to around 26 countries and is in advanced discussions with several major markets. Reaffirming its leading position at the forefront of the emerging 3D market, Sony is the key technological enabler of this new viewing experience and enhances the excitement of football fans, either watching a football match live in the stadium or enjoying a new 3D experience through 3D TV channels or at the public viewing events around the world. "Sony has long standing credentials in the creation of professional 3D technology and content for theatrical use," said Hiroko Saito, Deputy General Manager of Global Sponsorships, Sony Corporation. "True to our strategy 'From the lens to the living-room', we are actively involved at every stage of the 3D value chain and proudly draw on the strengths of the '3D World created by Sony', which encapsulates our expertise in professional solutions, consumer electronics, movie making and gaming alike. We are very excited to capitalise on these strengths and to be able to complement our compelling 3D proposition by bringing an entirely new viewing experience to the world of football through our partnership with FIFA," Saito added. Anybody see any of de games in 3D? How it look? From the few 3D demos I saw, I can say that more than 5 mins will give me a headache! I tried viewing with Comcast on-demand on my regular TV. It shows up with the two viewing angles squished next to each other. Didnt see any WC games in 3d, but have seen a few Premiership games. Interesting for a few minutes, but the truth is most of it isn't in 3D. Long term I'm not sure it will catch on unless they remove the need for glasses and the cost comes down to approx the same as 2D. The actual gameplay is virtually the same...just the on-screen graphics (team logos, starting lineups etc) and a few specific crowd shots and replays are really 3D. And if you think about it, the regular wide angle 2D shot that we are used to viewing is almost identical to the perspective you have in a stadium...you can't really make it any more 3D than it already is.